This is a Chad Valley baby walker, in good used condition. Batteries included. 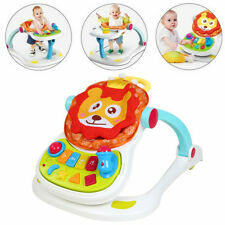 4 IN 1 BABY LION ENTERTAINER ACTIVITY TOY PLAY WALKER SOUNDS LEARNING GIFT NEW. 4 IN 1 LION ENTERTAINER. WALKER FEEDER SIT AND PLAY. The fun-filled activity panel can also be removed from the walker for extra sit-down play. New listingBaby walker with padded seat, sounds and lights. Baby walker has padded seat for comfort and has lights and noises to keep the child amused. In very good condition. Great condition, baby seat go around with lots of activities, Seat is removable too. It is fold-able/ foldaway with four way moving four wheels. Chicco baby girl or boy walker unisex walker. Seat of walker is also remove and washable. Very solid and durable walker. I have put the walker back in its original box. Fisher Price 4 In 1 Baby Monkey Entertainer Activity Toy Play Walker Feeder Seat. Condition is Used twice! Nearly new! Collection in person only. baby walker, seated chair, multi-coloured, with sound and lights. New baby walker, hardly used by owner. Mothercare baby pink my first car 3 in 1 convertible walker V-tech walker and jumbo baby seat & (v-tech sing and soothe extra)… (As displayed in the Picture - everything included). Mothercare pink my first car 3 in 1 convertible walker. Release Date: 08/09/2012. Orders will be fulfilled by our own warehouse or a 3rd party supplier at our discretion. Colour: blue. We promise to do everything possible to put things right for you. JEWELLERY & WATCHES |. Release Date: 08/09/2012. Colour: Red. We promise to do everything possible to put things right for you. TEXTBOOKS & EDUCATION. JEWELLERY & WATCHES |. COLLECTIONS & LOTS. AUTOMOTIVE |. CHILDREN'S & YOUNG ADULTS. Drive DeVilbiss Healthcare R8 Red Aluminium Rollator with Padded Seat and Vinyl Underseat Bag <7kg. Including: Very lightweight at less than 7kg. Height adjustable, 33" to 38". Arthritic-friendly loop cable brakes. It is also very light, assisting with manoeuvring and transportation. The R8 has anatomically designed, latex free handles for a comfortable grip, while the cable brakes are arthritic friendly, effortlessly allowing the user to brake or lock the rollator in place. Fits easily into pushchairs and car seats. Non-skid friction pads for added protection from stair falls. Toddler Walk Behind Mode. Baby Walker Mode. Removable easy clean seat pad. Trike Mode. Images shown are only a representation and may vary. Twist and shout with the Babylo Twist About Baby Walker ! This fun favourite is sure to keep your little one entertained as they learn to walk. The seat of this clever baby walker turns 120°, encouraging your child to reach for the toys to the rear of the walker. This sporty little racing car really puts baby in the driving seat. When the steering wheel is turned, the front wheels of the race car turn too! Supportive foot pad in rocker mode. Detachable, reversible frog / mouse toy. 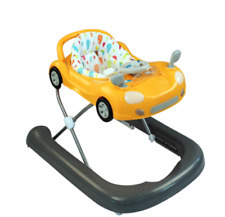 Superb racing car style baby walker that easily converts to a rocker for babies aged 6 months to 11kg. Suitable from aprox 5/6 months (when baby can sit up unaided) to 11/12kg. Height adjustable. Removable Seat pad. Babylo Twist About Walker. Folds flat for easy travel and storage. Removable and washable seat unit. Lightweight and compact. Communication is KEY to helping us give you the best experience. We will do our best to turn any less than satisfactory experience into a positive one. Product Type Baby Walkers. We go above and beyond to ensure you receive the best level of service. The On Tour Baby Walker is an interactive walker with the upper toy tray with toys, lights and sound. With a soft padded seat the height can be adjusted. The toy tray can be easily removed so that it can be used as a snacking tray. The BGR Jive walker is now available in the cute new pink and lilac colour option for little girls to love. Features a fun electronic playtray which plays musical tunes and lights. Can fold down for handy storage. Product Includes Musical and interactive play tray. Communication is KEY to helping us give you the best experience. We will do our best to turn any less than satisfactory experience into a positive one. The My Child Twizzle Activity Centre is suitable from 6 months and features a removable padded seat, which is height adjustable and be rotated 360 degrees. The bouncing footpad is lockable and the activity centre can easily be converted into a play table. The adjustable height allows the entertainer to grow with your child. Suitable from 6 months the Jump Around features a 360 degree fully rotating padded seat for lots of fun! Baby´s jumping is rewarded with lights, sound & music. Twizzle Entertainer Activity Centre. The My Child Twizzle Activity Centre is suitable from 6 months and features a removable padded seat, which is height adjustable and be rotated 360 degrees. The bouncing footpad is lockable and the activity centre can easily be converted into a play table. Musical electronic, interactive play tray. Removable play tray. 1 x Baby Go Round Jive1 x Instructions. Great minds start little. hey baby, let’s have a snack & learn! the tray actually rotates 360 degrees, so baby can access all of the toys -- including removable flash cards and turtle toy on the play bar, as well as, an octopus bead chaser, and electronic crab spinner toy with music and lights. A multi-functional jumper station loaded with features and functions. with lots of interesting and stimulating moving and musical toys to play with. lights and sounds help with babies co-ordination while playing. My first push along ride on car, this little push along has a few neat features, that your child will love. With a push beep! Horn and under seat storage, for all those favourite toys they can hide away. Very easy to assemble straight from the box. With a push beep! Horn and under seat storage, for all those favourite toys they can hide away. Push button horn with sound effects. My first push along ride on car, this little push along has a few neat features, that your child will love. My first fire engine push along ride on car, this little push along has a few neat features, that your child will love, With a push beep! Very easy to assemble straight from the box. Ride On cars. Ending soon. Baby walker with padded seat, sounds and lights.